Offering you a complete choice of products which include hot dip galvanizing plants. Jatindra Engineering Corporation is dedicated to the design and manufacture of high quality, durable, and energy efficient plant and equipment for hot dip galvanizing industry. Our team of engineers has been designing galvanizing plants and equipment for over fifteen years. During this time our team has designed and built many galvanizing plants with highly advanced and efficient galvanizing furnaces. These designs have evolved, and continue to evolve, into the most practical, fuel efficient, durable and innovative combustion systems and material handling systems available across the globe. Our motive is to introduce core technologies that helps reducing operational expenses and improves productivity. JEC is dedicated to help our customers to become the low cost producers. In support, we have an experienced team of engineers, technicians, and commercial staff making us an eminent designer and equipment supplier for Hot Dip Galvanizing Plants across the globe. JEC offers Hot Dip Galvanizing Plants that can satisfy our client’s budget and requirement. We have designed and developed several Batch type Hot Dip Galvanizing Plants, as well as Automatic Tube and Spin Galvanizing plants. 1. Chemical pretreatment area (de-greasing, pickling and fluxing). However, we can also supply more comprehensive solutions, enriched by automation in lifting and transport of products of all sizes and categories. 2. 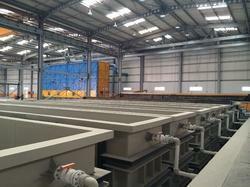 Standard configuration plants, inclusive of the hot baking section (galvanizing furnace and dryer). 3. Post galvanizing treatment area (cooling, coat passivation and drying). We are capable to design and build a plant tailor made to the specifics of your concern. This includes the capacity to design and install for green field projects as well as for existing units (full revamping of existing installations). Our manufacturing program includes design and supply of plants for steel structural, railway components, power transmission towers, poles, road barriers etc. The Hot Dip Galvanizing Plants for Tubes and Hollow Sections are completely automatic and allow the galvanizing of water or gas line tubes with diameter from ½” to 8” and with the length from 4.5 to 7.5 meter. These plants are highly efficient and allow obtaining a constant and continuous production for each diameter of a tube in process.